A growing divide is forming among college savers. 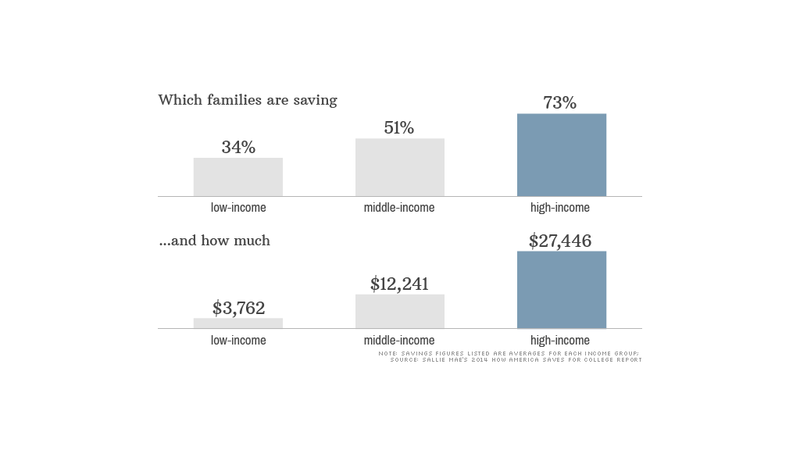 While many middle and upper-class families are saving more for college, lower income families are still struggling to save anything at all. Nearly three-quarters of families earning $100,000 a year or more are saving for college, while only 34% of families earning less than $35,000 are putting anything away, according to a report released by Sallie Mae and market research firm Ipsos Thursday. Among those who are saving for college, average balances grew by 30% to an average $15,346, fueled by increased contributions and, in some cases, stock market gains, according to a report released by Sallie Mae and market research firm Ipsos Thursday. But the higher balances were predominantly enjoyed by mid- and high-income families, many of whom said they were able to save more because their income had increased. "Middle-income and higher-income families have come out of the recession. They've adjusted their behavior, they're more optimistic and they're starting to save again," said Cliff Young, managing director at Ipsos. Meanwhile, the average college savings balance of low-income parents fell 26% to $3,762 — a mere fraction of the amount saved by wealthier families (see chart). The majority of those who aren't saving said they simply don't have the extra money. Many of these families still haven't recovered from the recession. The survey found that only 51% of families with children under the age of 18 are saving for college, compared to 62% in 2009. At the same time, college costs continues to rise. Average costs for tuition, fees, room and board at a public university rose 3% to $18,391 this school year, while private college costs averaged more than $40,000, according to the College Board. The most common college savings vehicle cited -- especially by lower income families -- was a basic savings account, which typically earns a meager return of less than 1%. Meanwhile, nearly 20% of savers said they were using retirement accounts to save for college and 29% said they were putting money into a 529 savings plan, which allows account holders to invest and use the earnings tax-free for qualified education expenses, like tuition, fees and room and board. And 14% said they had stashed money in prepaid state tuition plans, which allows parents to prepay for tuition at today's rates.